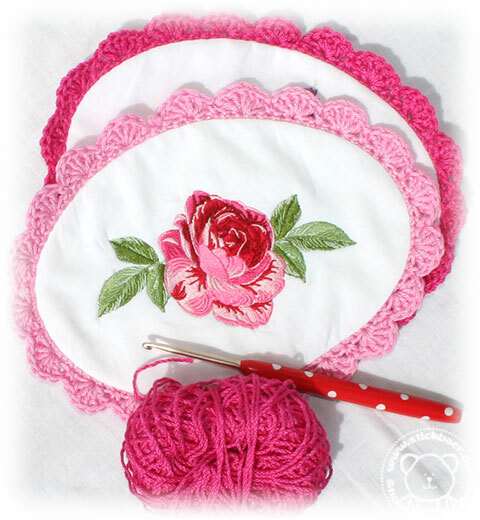 Do you have a favourite hand crafting for the different times in the year? 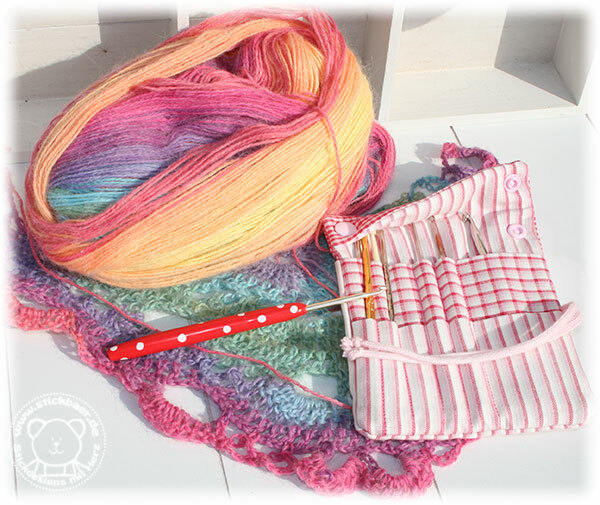 I am crocheting and knitting only when it is warm, means in summer. Sounds strange? I simply need the bright sunlight and love it to do the work outside on the terace. 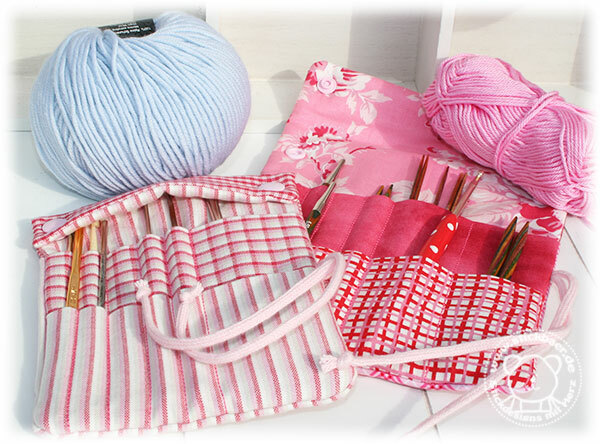 In winter I do not feel like doing knitting or crocheting. So when there are unfinished projects in autumn, they stay til next summer. 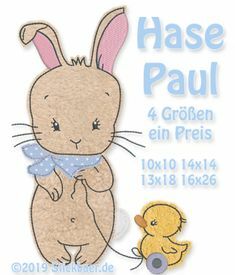 Thus sayed, here is my next embroidery file, in July. 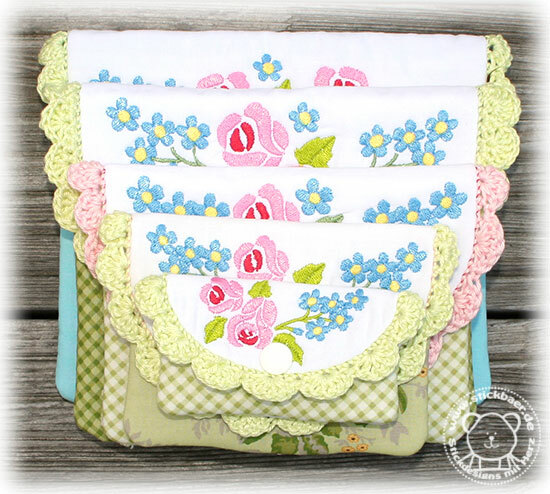 The 5 different in size bags will be crocheted after embroidery with a small edge. 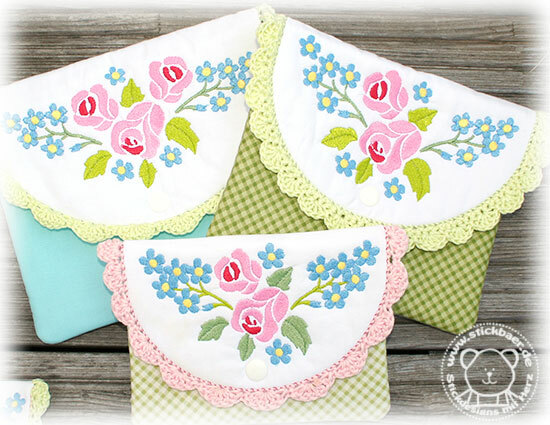 The bag is completely done in the embroidery machine including the crochet support seam. 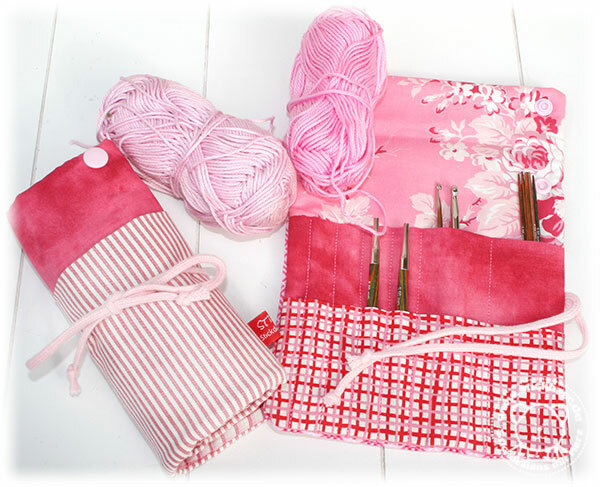 The only thing left to do is to take the crochet needle and do a crochet edge according to our instruction. And this is done in a little time only, so this project will be finished til autumn. 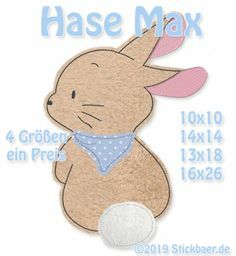 We have a file for each hoop size, starting at 10x10cm up to the 20x30cm hoop. The bigger bags can be used for cosmetics. The one for the 13x18cm hoop is perfect to hide the lipstick, powder box and co. The 10x10cm size still keeps a lipstick or the bus ticket. And all they are so cute. 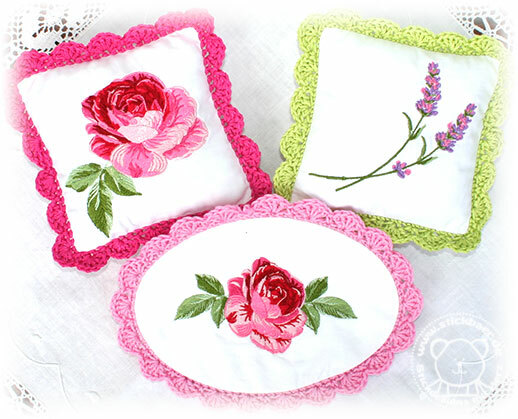 Each of the embroidery motifs differ a little bit. You can get each size separately or opt for a discount package. Get your choice today in our Stickbaer Shop. 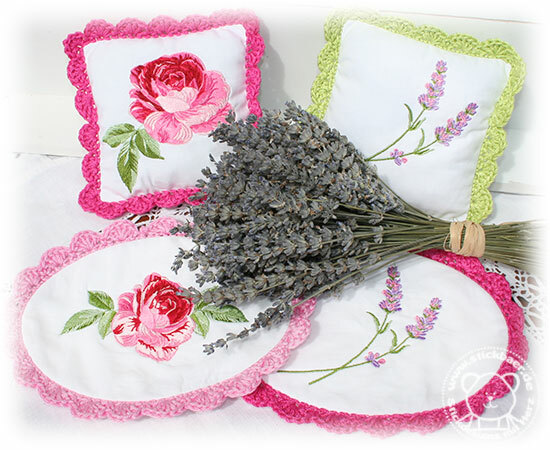 Since you loved our Lavender and Roses files “Rose et Lavande” and “Lavendelsäckchen” so much here is a last one with these romantic motifs. 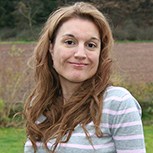 We love in-the -hoop, it is so easy to create perfect results. 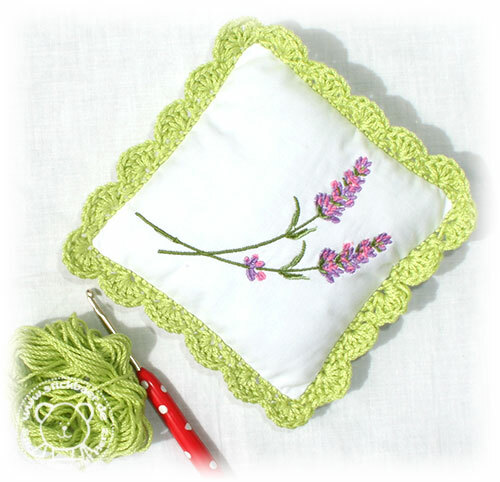 And as we love crocheting as we love embroidery and ITH we now joined both crafting methods. 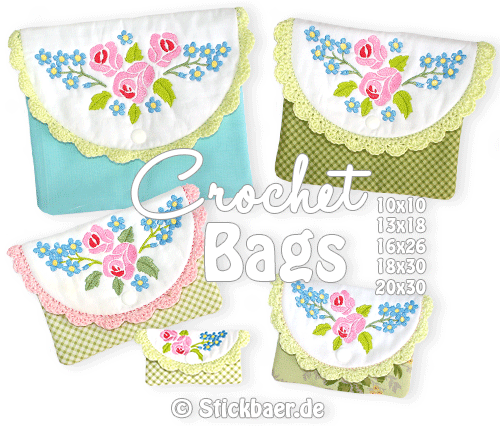 Not sure you remember our Häkeltaschen that already has a crocheting edge embroidered on to attach the crochet edge. 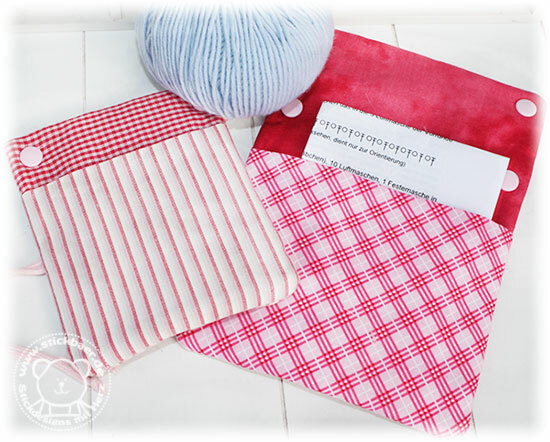 Now we have mugrugs, hearts and little pillows that you can crochet on. During the embroidery an additional seam is embroidered. 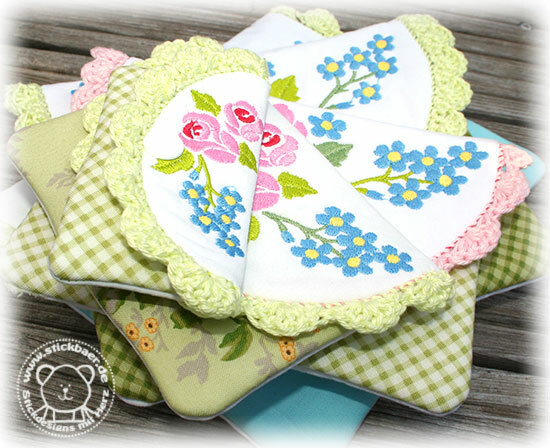 To this you can later attach your crocheted border. This you create overwhelming pillows and mugrugs. 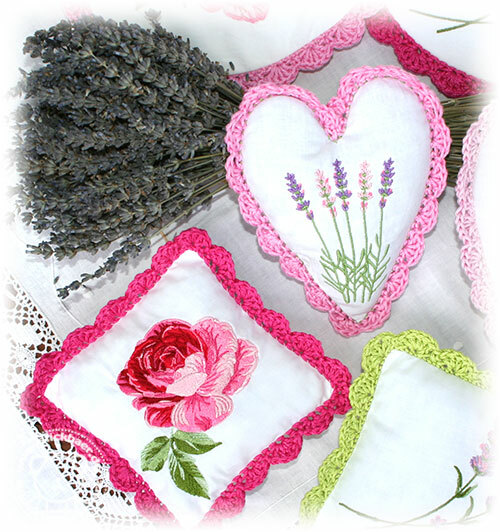 I filled the hearts with lavender. They are so romantic. I hang them into the wardrobe. 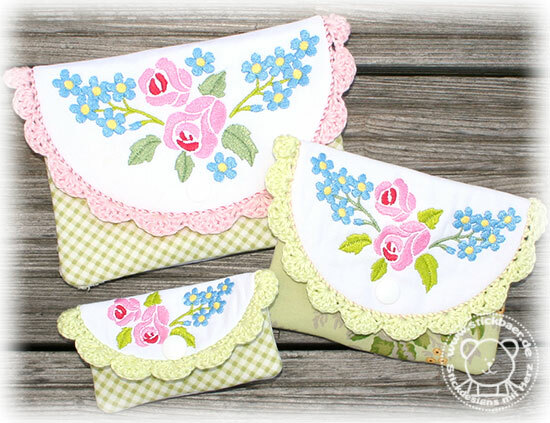 The square pillows could be used as pillow for dolls, pin cushion or filled with lavender too. Or leave them without filling and you get a coaster. The mugrugs can be stuffed with polyfill. This makes little oval of them. As mugrugs they are the center point of your comfortable tea time. Or coffee time. The crochet around is done easy. 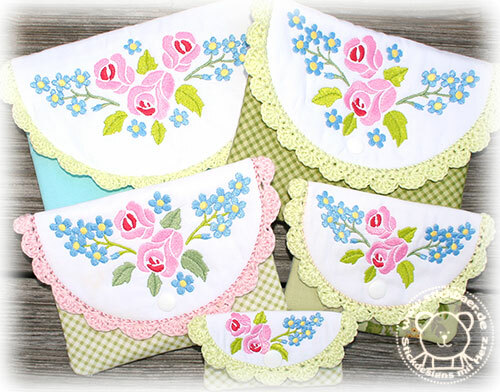 Nevertheless I added a detailed embroidery and crocheting instruction, explaining each step. 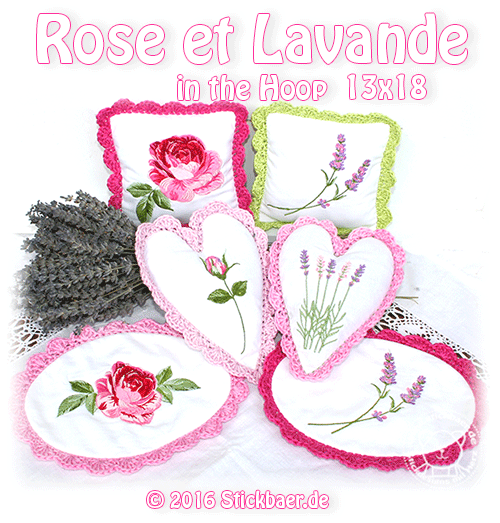 Our embroidery file “Rose et Lavande ITH” matches the 13x18cm hoop. You can get it from today in our Stickbaer Shop. 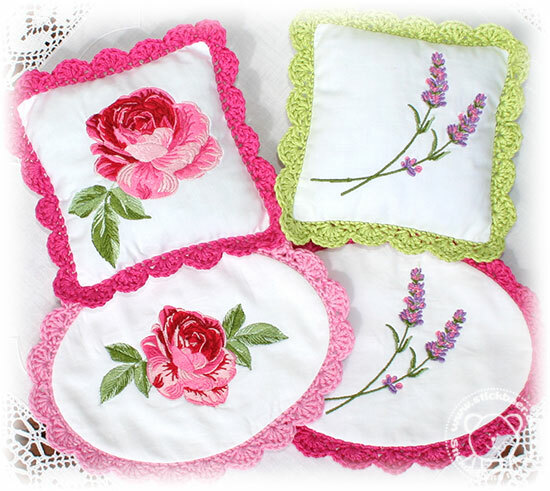 Have fun with embroidery and crocheting. You can do this while watching a match of your favourite football team at the European Championship. After 3 weeks of summer vacation here is my “I am back”! I am full of energy and my head gets screwed up because of the many ideas I already have. During the vacation I had so many ideas. You will see this over the next weeks. Probably you know this: when you stop one thing for a while after some time it is tying you back with even more enthusiasm then before. So it happened to me. After the time off all doing is very easy now and that’s why I can present my first “after vacation” file today. The inspiration I got when sitting on the holiday terrace and doing crocheting. 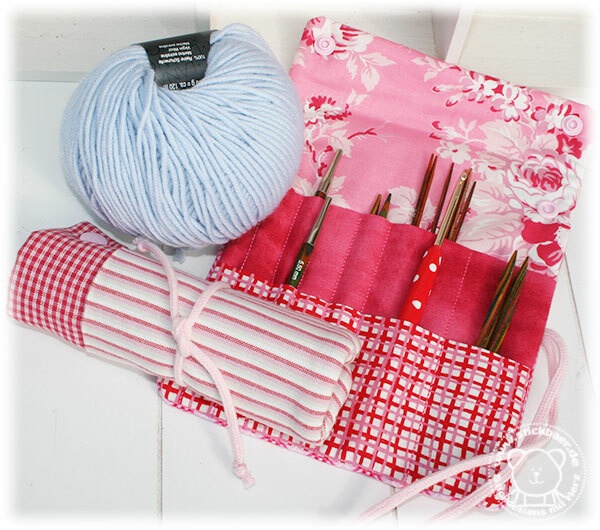 My crochet needles, the thick wool embroidery needles and the knitting needles I brought in a cosmetic bag. It was not that easy to find the right needle in this mess. 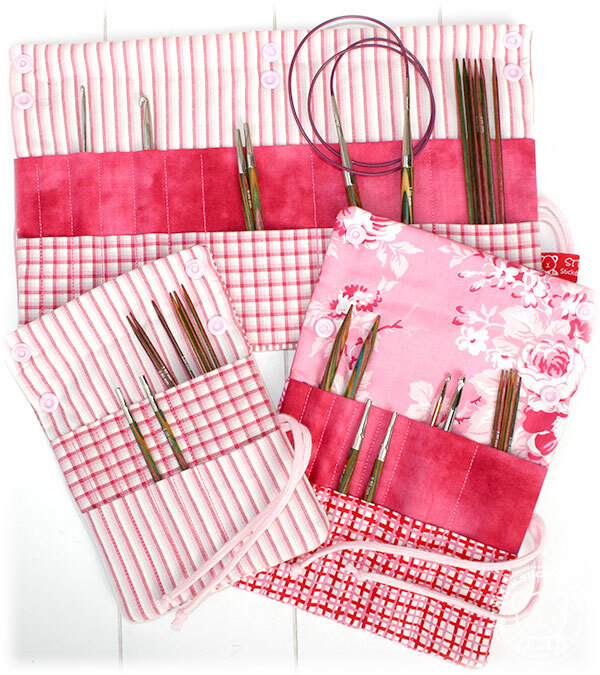 All crocheting and knitting needle can find a place here. Each needle has it’s place. One can sort the needles by size. So it is easy to find the right one. Why couldn’t I have this idea earlier?! 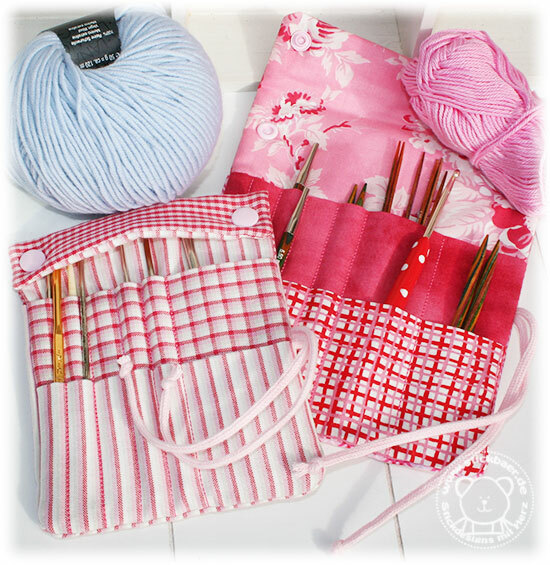 Crocheting needles can go into the narrow pockets, while thicker needles or round-knitting needles go into the wider pockets. The upper part will be folded over and snapped on so nothing slides out. When rolled I can carry the needles safe or put them to the wool basket. 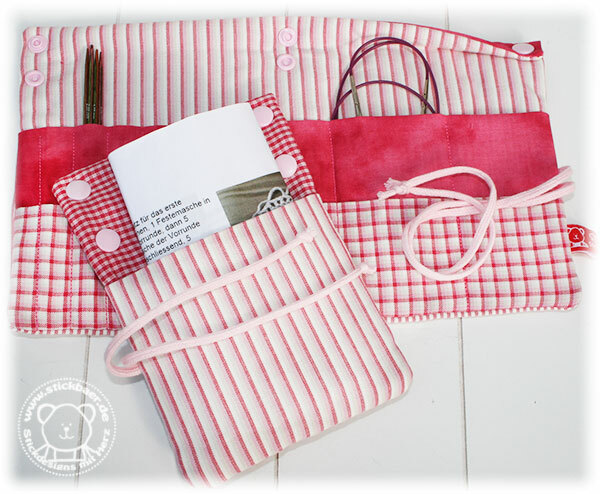 On the backside of the needle case is an additional pocket for crocheting or knitting instructions. All is now in one place. 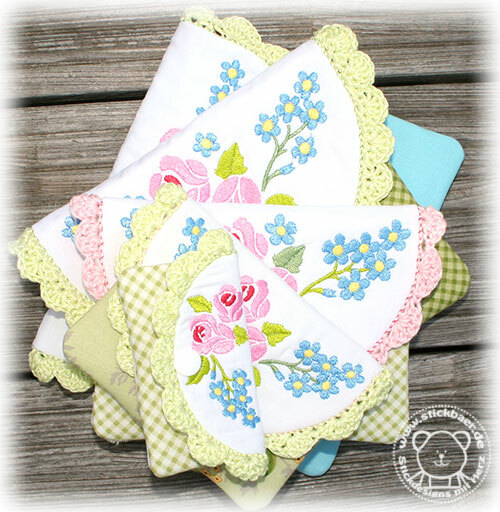 I can start crafting on my current project without extensive search. Even circular needles get their place. the 18x30cm case has 12 narrow and 6 wide pockets. All sizes have a large pocket on the backside. Now it is on you to decide for your size. Or you go for one of our sets with several sizes. And now? 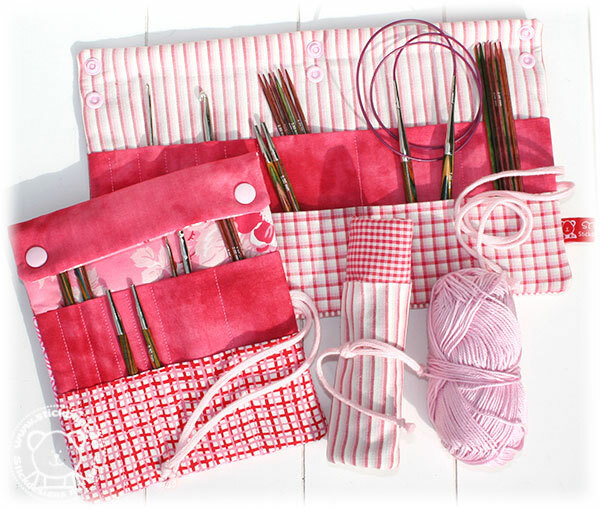 Are you up for hand-crafting? 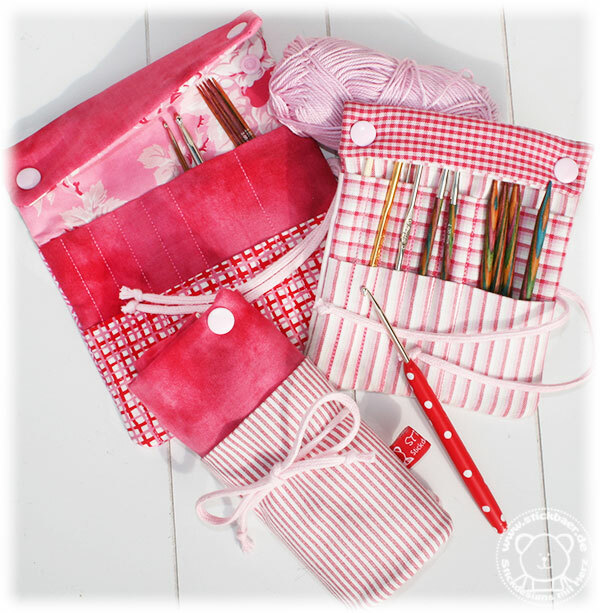 Do our Needle case now and you can start your autumn wool project in an ordered manner. 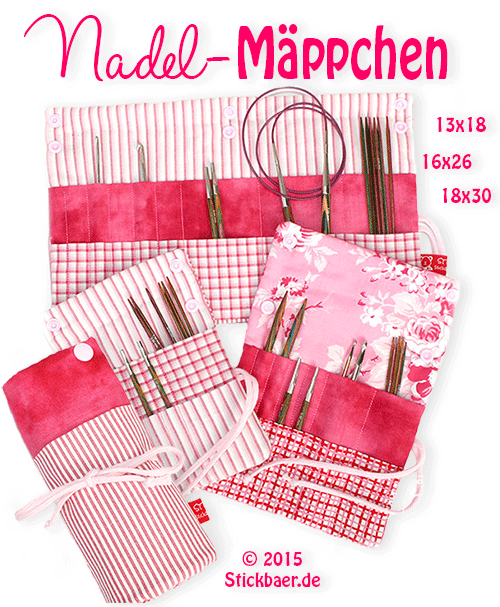 All files for the “Needle case” are available from today in our Stickbaer Shop. Enjoy your weekend. Be creative!